My yellow lab did this and now she’s afraid of the dishwasher! Yep, I had tried everything to keep my puppy out of the dishwasher. He got his collar caught a few weeks ago and hasn’t gone near it since. Oh my! Look at that face!!!!! What a lover. Our pit did the same thing. Now she wont go into the kitchen if the dishwasher is open. Oh, how sad is that face? Hugs! aww such a sad face! I also have a yellow lab prewash cycle feature for dirty dishes…you gotta luv em!! My choc. Lab did the same thing! But he still pre washes the dishes as i am loading the dishwasher! Been there done that! Hugs from Jessie the chocolate lab! And Ringo the heeler mix. Mine gets her tags stuck in the heat registers and walks around with it dangling from her collar. My boxer did the same thing about 8 months ago and still take a wide turn when passing the dishwasher. A dog can get strangled this way – remove their collar before allowing “pre-wash”! 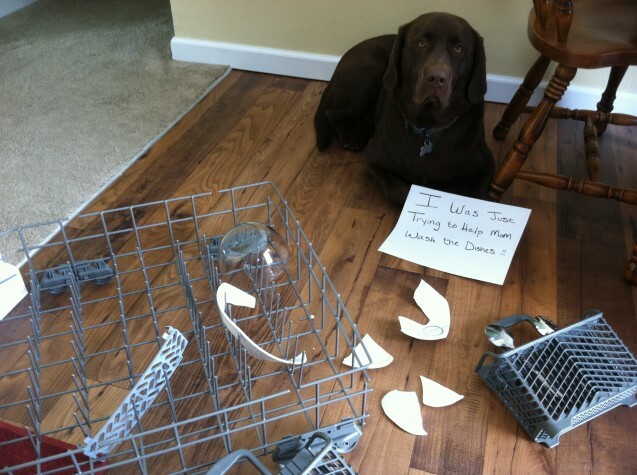 Oh my…my lab does this and he got caught once too. But he did not learn his lesson :0 He sure looks sorry! Some people need to lighten up and get a sense of humor. Life is tough enough and then people feel the need to reprimand others. I’m sure all these dogs posted here are better taken care of than some kids. Life is good, lighten up already. Oh my Gosh!! Our lab did the same thing!! Dishes were flying…utensils……..
Barney the black lab ‘helps’ mum pre wash but seeing as the crockery and cutlery go everywhere it takes twice as long to fill! As a puppy he would also sleep on the open door as it was still nice and steamy warm from washing. The door is also good for hurdling! Cute comments. I see the risk, but our dogs don’t have the freedom of the house when we are not home. I do have one that I have to continue to remind to stay away from the dishes when I am loading the dishwasher. A little scare might be a good thing? Luckily he follows me everywhere, so I can catch him in the act early on. I’m not a fan of dogs licking the dishes….and so I may be criticized here. My chocolate lab Maggie has done the same thing. Fortunately I have been able to intervene before she destroyed the dishwasher and the dishes. I love the way that dogshaming makes me feel like I am not alone in the insanity that is my life.